At the 2015 Ironman World Championships, Jana Richtrova placed second in the 35-39 age group, was the 11th place amateur female overall, posted the second fastest bike split for all amateur females, and finished as the 18th overall female with a total time of 10:21:09. This was Jana’s third trip to the IRONMAN World Championships. Her first trip was in 2012, which also happened to be her first IRONMAN ever after qualifying at Buffalo Springs 70.3. She finished 15th in her age group and 84th female overall at her first attempt in Kona. Her second appearance was in 2014, placing sixth in her age group and 46th female overall. Richtrova qualified for this year’s championships at IRONMAN Cozumel in 2014, which she raced six weeks after the 2014 Ironman World Championships. She finished first in the 30-34 age group, second female amateur overall, and eighth female overall with a personal best of 9:58:44. She also had the second female fastest bike split including pro athletes with a 5:14:46. With her steady rise in her age group, Richtrova had high goals for the 2015 IRONMAN World Championships. Along with the training, we created a detailed plan for race day that would maximize her potential. After a slow swim of 1:18:37, Jana came out of the water in 57th place in her age group and had a lot of ground to make up. She swam the same time last year, but after a lot of work invested in improving her swim over the year, it was a bit disappointing for her to come out so far behind. She put the swim out of her mind and moved on, quickly focusing on her bike strength to make up for lost time. As her coach, I used her training data, race rehearsals, as well as BestBikeSplit to predict her performance potential. 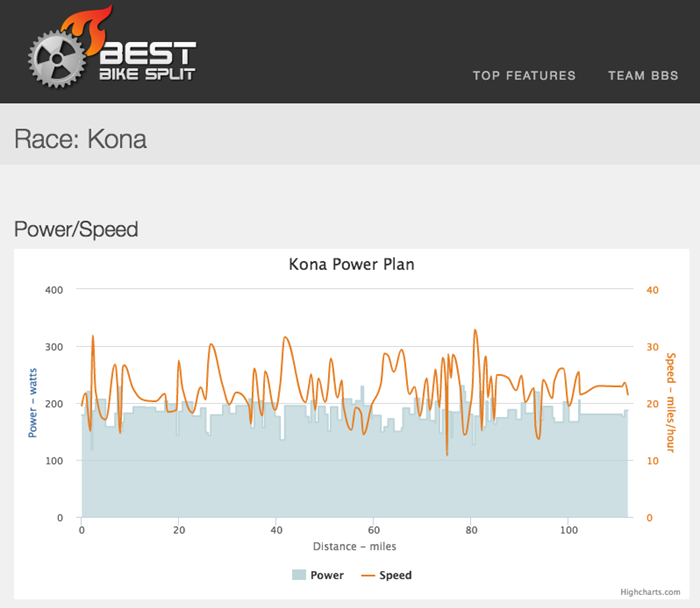 Using previous IRONMAN bikes splits and the BestBikeSplit “get weather” feature to estimate the correct drag coefficient (among other variables) to get the best possible time prediction for Kona. The BestBikeSplit model predicted a 5:13:44 split riding at 0.73 Intensity Factor (IF), 190w Normalized Power (NP), 185w Average Power (AP) and 278 Training Stress Score (TSS), all on par with what she averaged on various training rides. You can see her complete BikeBestSplit race plan here. First 10 miles – ride 5 watts slower than race pace until the Queen K.
Miles 10 to the start of Hawi climb – ride at race pace. 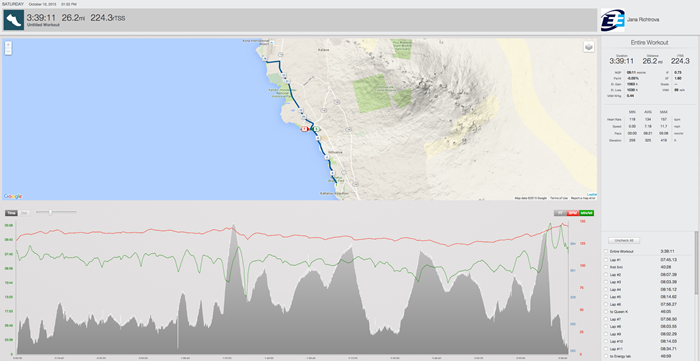 Hawi Climb – ride no more than 10 watts above race pace. 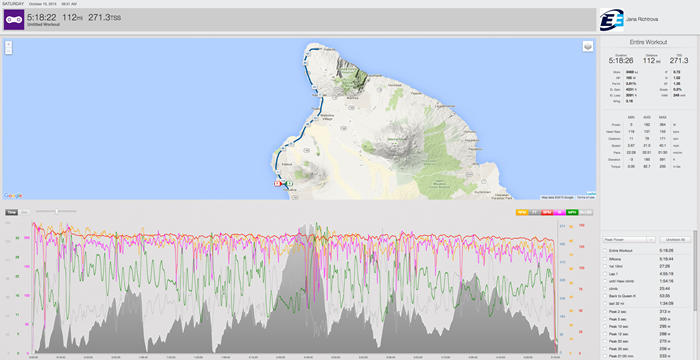 Hawi turnaround back to the Queen K – ride at race pace, or minus 5 watts. 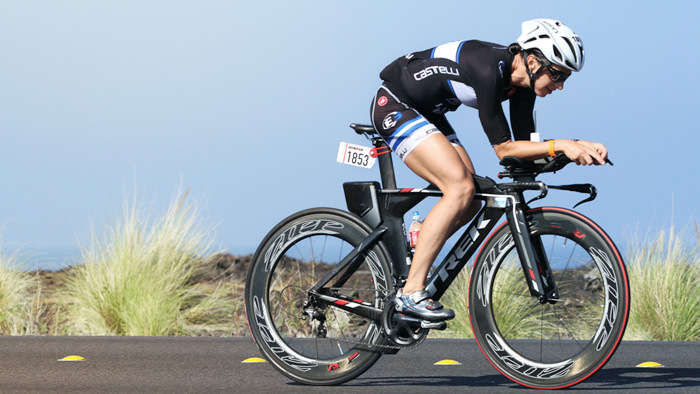 Queen K to T2 – ride 5 to 10 watts above race pace. She rode a bit hard and too variable in the first 10 miles due to traffic usually encountered coming out of T1 and on Kuakini Highway. Along this out and back section she had an NP of 192 watts. Once on the Queen K, she settled at race pace and had a 189 watt NP until the beginning of the Hawi climb, keeping the variability in check with a 1.01 VI. On the climb up to Hawi, she kept her pace in check based on feel as she noticed the heat was pretty intense. Instead of pushing at the prescribed 5 to 10 watts above race pace, she stayed close to it and focused on fueling with a 192 watt NP and just 0.74 IF. From the Hawi turnaround all the way down to the Queen K her power dropped to 182 watts, but this was expected due to some of the ‘energy saving’ strategy of coasting the descents once she was geared out and up to speed. This is noticeable as her average speed was 23.5mph in spite of the lower wattage. Once back on the Queen K the goal was to push the pace ‘a bit’ by riding 5 to 10 watts above race pace and make a move in her age group to reach T2 as close to the front as possible. With the temperature rising and a strong head wind, she stayed at race pace at 189 watt NP and 1.01 VI until mile 95. Then the road got a bit crowded as she caught up with other male riders. But because some male riders don’t like being passed by women, this resulted in a cat and mouse game. So, instead of using extra energy to battle male egos in addition to the strong headwind, she decided to slow down a bit riding at 179 watt NP and keeping variability in check at 1.02 VI. Her total bike split was 5:16:32 with 186 watt NP, 182 watt AP, 0.72 IF, 1.02 VI, 21.1 mph, 270 TSS, 79rpm and 3.16 watts per kilogram. This was a bit slower than the BestBikeSplit prediction, but this was probably due to the lower AP/NP and slowing down some over the last 12ish miles. Jana passed 52 females in her age group and started the run in 5th place. View Richtrova’s full bike file. On the run, the plan we set up was for her to run focused on heart rate and perceived exertion for 20 miles. Then she would switch to pace and perceived exertion thereafter in order to attempt ‘racing’ the last 10km. The goal was to keep her from starting too fast, something that has affected her in previous races, and to address the tough hot weather conditions. Mile 20 to finish – go by perceived exertion at fastest possible pace, or slowing down the least. Jana followed the plan very well for the first 5 miles while running on Ali’i Drive keeping her heart rate (HR) at 137bpm in spite of a slow pace (for her) of 8:05 minute per mile. This supported by her Efficiency Factor (EF) which was her second best of the day at 1.63 and allowed her to move into 3rd place. The next 5 miles including the toughest climb of the day going up Palani Rd, her HR average was 139 bpm and 8:10 minute per mile pace, and though this was within her race pace target, it seems for the conditions it was still a bit fast when considering her normalized graded pace (NGP) was 7:54 minute per mile. Still, she began closing the gap to second place to under 60 seconds. The next 6 miles or so from the Queen K to the start of the energy lab, she stayed on target. Though she followed the set fueling plan, heat and fatigue began affecting her. She dropped her HR average to 134bpm while running 8:26 minute per mile and 1.59 EF. Still, her sole focus was to stay patient and prepare for the last 10km. The 3 miles in the energy lab were a rough patch as she struggled with the heat/fatigue. Her HR average continued to drop to only 130bpm though some of this was due to the descent at start. Her pace also dropped to 8:43 with an EF of 1.56. The gap to 2nd place grew to 2min while 4th place started to gain on her. Once out of the energy lab, the last 10km terrain is rolling and while she was still struggling, she knew this was the time to be mentally strong, ignore HR and race. Nonetheless, the next 3 miles she struggled managing a race slowest 9:02 min/mile pace and 1.53 EF. 2nd place was now 2:30min ahead and 4th placed closed the gap to under 40 seconds. In spite of struggling, she kept a positive outlook focusing on fueling and taking one mile at a time. Or as she later commented “I didn’t want to get caught again as it happened last year, so I just kept pushing through the pain moving forward hoping for a second wind”. At mile 23, it seems Jana’s pace plan, mental resilience, and fueling focus paid off. She was able to speed up each mile clocking an 8:29 minute per mile pace for the next 2 miles before the downhill on Palani Rd. Then, she managed to close the gap to second place to under one minute and extended her lead to fourth place by over 1:30. She was speeding up, and the second place woman was slowing down. As she became aware of this, she put her head down and ran as fast as she could leading to a 6:40 minute mile for the last 1.2 miles and catching second place just before the turn onto Ali’I Drive! Her average pace for the last three miles was 7:43 minute per mile, 7:44 NGP, and a race best 1.65 EF.